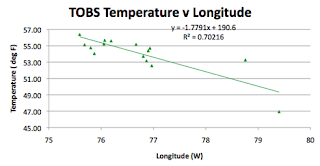 Moving up the East Coast from Virginia, the next state is Maryland, where I will look to answer the continuing question on whether it too is showing the significant drop in temperature that seems to hold along the Atlantic Coast from around 1948 to the late 1960’s. 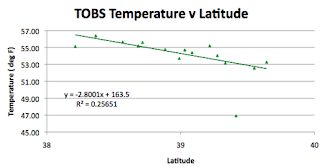 It was not evident in the first temperature plot that I made for Missouri when I began this series, and only drew my attention as I reached states along the Atlantic Coast. 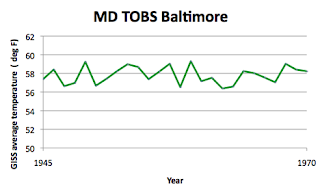 Mayland has one GISS station on the list, in Baltimore. 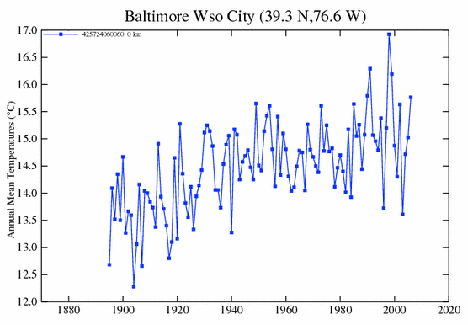 And there are two Baltimore entries on the GISS site, one runs from 1895 to 2006 (Baltimore WSO City) and one from 1950 to date (Baltimore Blt/Washington International). It is, of course, the latter that has the correct co-ordinates for the current single GISS location that they use. 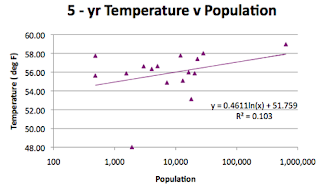 I say of course since this (truncated station data) has been a common discovery as I have moved through the individual states. 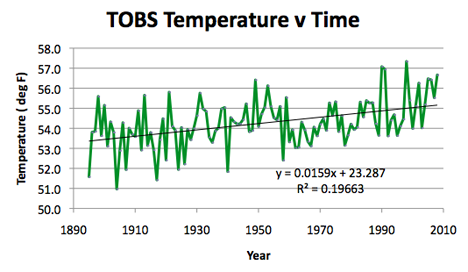 I had a look at the longer time record station and it does not show that temperature drop that I mentioned at the beginning of the post. 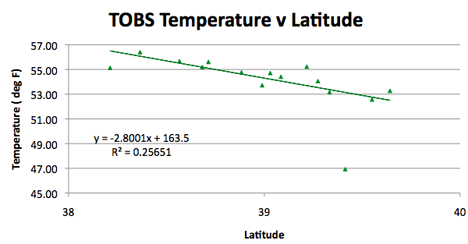 Historic temperature data for Baltimore MD, as recorded at the GISS station no longer used by them. In contrast the site that has been retained does clearly show the drop in average annual temperature, from 13.67 deg C in 1953 down to 11.85 deg C in 1963, (a drop of 1.82 deg C, 3.3 deg F) consistent in size with the temperature drops seen further south. 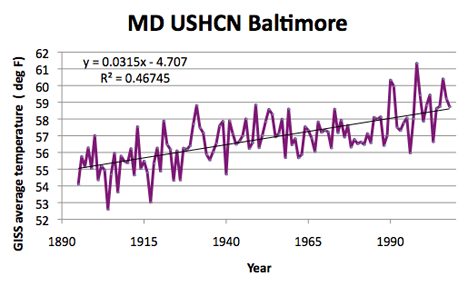 Annual temperatures as reported by GISS for the station in Baltimore MD. 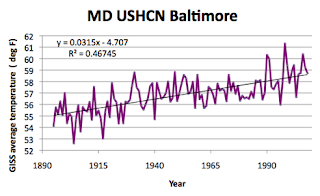 And when the Time of Observation corrected raw data is examined there is no discernable drop, suggesting perhaps that the phenomenon is closely related to changes in the Sea Surface Temperature (SST) over that time interval, since the Science Center is surrounded by Baltimore. Time of Observation corrected (TOBS) temperatures for the MD Science Center in Baltimore over the period where other states show a fall in temperature. If I turn to the state as a whole, there is a difference between the sole GISS station temperature and that of the average of the USHCN stations, even with the homogenized data and the shorter time interval. 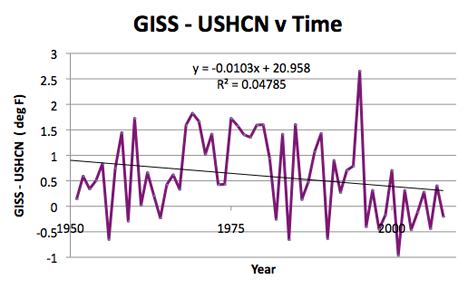 Difference between the GISS temperature for Maryland and the average of the homogenized USHCN station temperatures, in the interval where the GISS station has been functioning. 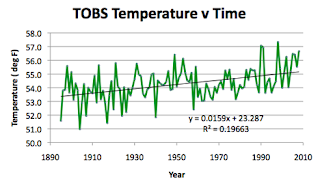 For the state as a whole, the data shows the three dgree drop in temperatures, both for the homogenized data, and for the TOBS values. 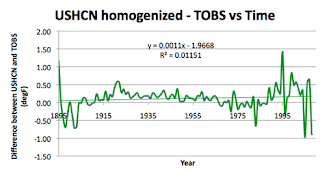 The difference in temperature rise for both is relatively similar 1.59 deg F per century for the TOBS temperatures and 1.69 deg F for the homogenized. 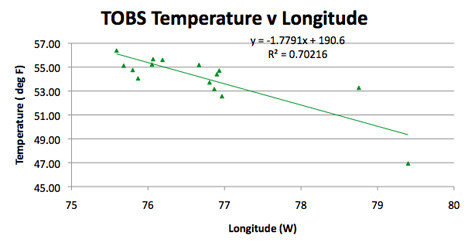 Given the strong influence of the adjacent ocean this is not perhaps surprising. 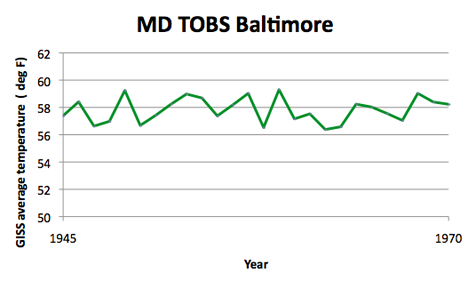 Average temperature for the state of Maryland over the years, from the TOBS data averaged for the stations in the state. 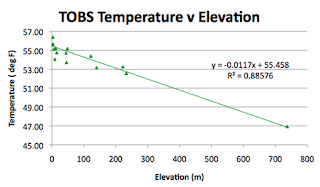 The two stations over on the far west of the state (Cumberland and Oakland) are also at a much greater elevation, however when I averaged the two over the same interval I get that same drop in temperature that I have been discussing. 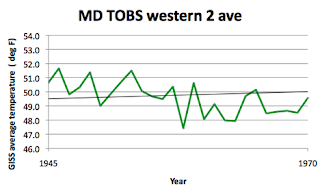 Fall in temperature in the period from 1940’s through the 1960’s for the two western stations in Maryland, averaged TOBS data. 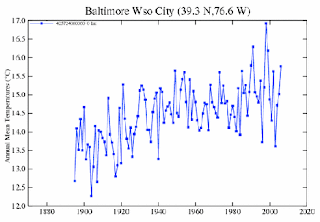 Maryland is 250 miles long and 90 miles wide, lying between 75.07 deg W and 79.55 deg W, and 37.88 deg N and 39.72 deg N. The mean latitude is sensibly 39.5 deg N. The USHCN average latitude is 39 deg N, and for the GISS station 39.28 deg N. The elevation rises from sea-level to 1,024 m, with the mean being 107 m. The USHCN average is 97.5 m, while the GISS station is only 6.1 m above the sea. 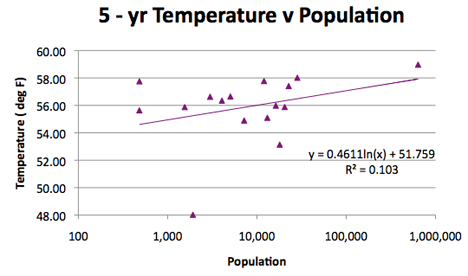 Looking at the way in which geography changes the temperatures around the state. Seeking information on populations around the various stations, Royal Oak didn’t appear in the citi-data list, and so I used the zip-codes site to get 483. Woodstock is a suburb of Baltimore, and is folded into Baltimore I suspect, so I again used the zip-codes site to get a population of 7,192. 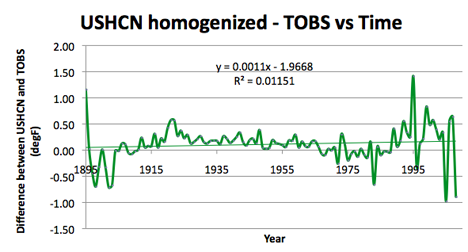 It dawns on me that the difference between the homogenized and TOBS data is generally quite small the closer we get to the present, and this should mean that ther should be a correlation with homogenized data, now that I am only using the past five years of temperature data to correlate with relatively recent population. 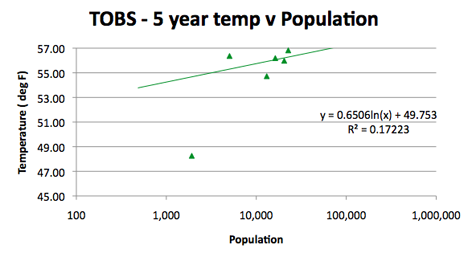 (I wrote this before plotting the final graph). Maybe I was being a little optimistic.